A strongly-supported workforce is essential to a successfully-transformed health care delivery system. Across the Adirondacks and North Country, we are working with our partners to address workforce needs to develop and implement successful strategies for recruitment and training. Workforce funding ended on February 8, 2019. Thank you to everyone who participated. 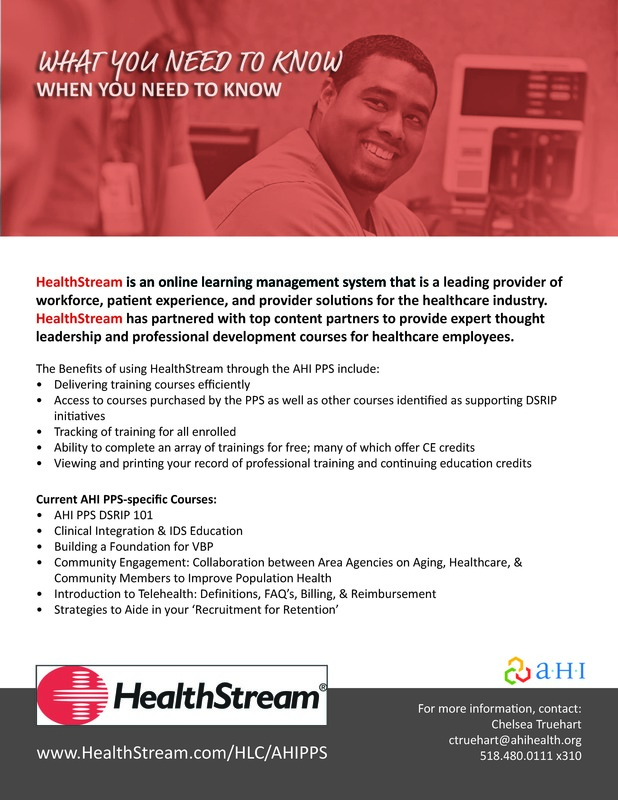 HealthStream Learning Management System – Access is for AHI PPS partner organizations. If you require assistance or would like additional information, please read the HealthStream flyer or contact [email protected]. The Workforce Committee is responsible for the development, implementation and oversight of workforce activities to ensure the AHI PPS hires, retains and trains staff to support successful health-care transformation. The committee is the governing body for all workforce activities and includes representatives from each of our nine counties. Membership includes representatives from hospitals, primary care, long-term care, behavioral health, public health, education and training, and labor sectors. Meets as needed to assist in the completion and analysis of the compensation and benefits analysis. Assesses impact toward the future state. Meets monthly to review Recruitment Fund requests. Also assesses training/strategies needed to provide sustainable, ongoing approaches to partner recruitment. Meets monthly to review Training Fund requests and other training occurring throughout the PPS. Reviews the training strategy and annual training plan updates. If you have any questions about our workforce initiatives or committee/workgroups, please contact [email protected] for more information.